Greetings! Last week, I posted a little bit about the “Middle Ages in the Modern World” (MAMO) conference at St Andrews—a posting about Canadian heraldry. I would now like to provide a belated, more general overview of the conference as I saw it. My key words for this posting are TRANSLATION and ECOLOGY (two concerns that are perhaps not too surprising given my most recent posting about endangered languages). 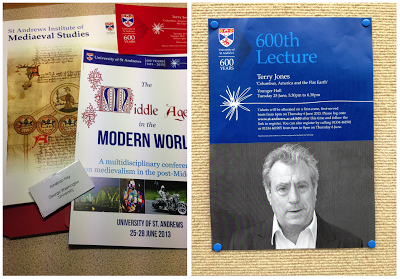 My desk in Blackadder Hall (left); flyer for the Terry Jones plenary (right). The inaugural MAMO conference was a highly publicized event, years in the making: it marked the 600th anniversary of the founding of St Andrews, a university which is quite literally a medieval institution in the contemporary world. The conference venue testified in many ways to how the medieval past infuses popular culture in the present, and in addition to many presentations encouraging creative modes of thinking across time, a significant concern in many threads concerned the blurring of boundaries between “professional” and “amateur” medievalisms. The opening plenary, for instance, was delivered by none other than Monty Python member, Chaucerian, and public historian Terry Jones. Many of the conference participants (myself included) lodged at the implausibly named Blackadder Hall—a site named (alas!) not for the multiply reincarnated protagonist portrayed by Rowan Atkinson but a real-life person, Agnes Blackadder (1875-1964), the first female graduate of St Andrews. This wide-ranging interdisciplinary conference encompassed a variety of ways the medieval past (or a consciously constructed neo- or pseudo-medieval one) informs many types of cultural production: literature, visual arts, cable television, and other media. I found myself most intrigued by how translation—cultural, linguistic, and artistic—served as a key concept throughout disparate threads. 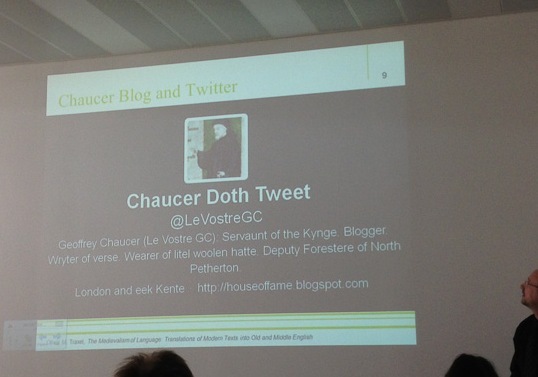 Oliver Traxel's presentation on reverse translation; slide referring to Geoffrey Chaucer Doth Tweet (@LeVostreGC). Some of the most compelling sessions tackled translation in its manifold linguistic forms. For instance, one session on “Translating the Middle Ages” yielded a striking variety of approaches to medieval languages moving across time and space. Helen Brookman provided a glimpse into the fascinating reception history of Anna Gurney, who was the first modern English translator of the Anglo-Saxon Chronicle (her translation was published in 1819). Living a life that might now register as queer (she resided with longtime female partner) as well as disabled (she was wheelchair user), Gurney forged her own literary authority and reputation as a medievalist scholar by working around many social and institutional barriers. Katherine Miller examined the rather squeamish range of approaches to Old Norse terms denoting slavery in modern English translations and dictionaries (modern translations and dictionaries tend to evade or obscure references to slavery—due to a level of discomfort with its acknowledging its presence, or a lack of full understanding of the nuances of the language, or both). Oliver Traxel offered an engaging overview of “reverse translation” (i.e., translating modern English works into older languages like Middle English and Anglo-Saxon) throughout modern Germany and Anglophone North America (including Geoffrey Chaucer Hath a Blog and the related twitter feed). What emerged from Traxel’s talk was a clear notion of translation as a means of academic play, parody, and enjoyment—activities pursued not out of any profit motive or use value. 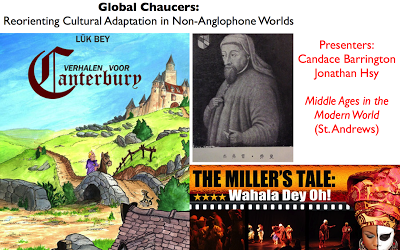 Opening slide of our Global Chaucers presentation. 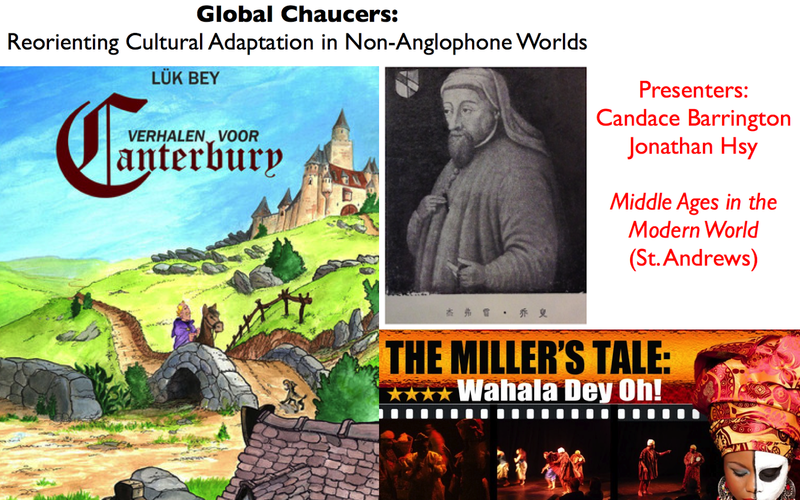 In a session on “Global Medievalisms,” Candace Barrington and I drew from our work on the Global Chaucers project to discuss how Chaucer’s Miller’s Tale is translated across three very different contexts: Flemish comic book by Lük Bey (preview the Flemish and English iPad apps online! ), a Chinese prose translation by Fang Chong (which I’ve blogged about HERE), and song-and-dance performance in Nigerian Pidgin English (view snippet HERE). Each work draws (broadly speaking) from a common source-narrative, yet each work adapts its own idiosyncratic strategies for conveying local nuances of linguistic register and discursive style. The other panelist, Dongill Lee, compared his own Korean translation of Beowulf to those of Heaney and others. Among other things, he considered how Anglo-Saxon heroic values might be reoriented by a cross-cultural comparison with feudal structures in ancient Korea and Japan (and he also mentioned he had previously published a Korean translation of The Canterbury Tales). 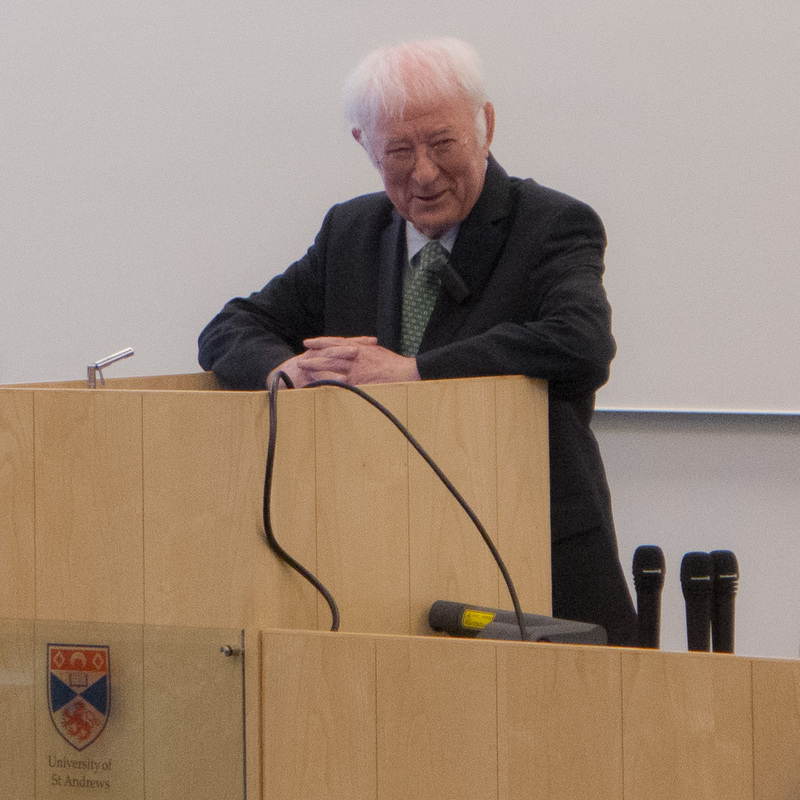 Seamus Heaney reads from his translations of Middle Scots poets. In my mind the culmination of this thread—and perhaps the conference as a whole—was a plenary lecture by Seamus Heaney; the poet read from (and spoke about) his translations from works by 15th-century Middle Scots poets (so-called “Scottish Chaucerians” including Henryson, Dunbar, and others). Heaney began by suggesting three motives for translation: translation as a mode of advocacy for a source text, translation as a means of contact with another alien culture, and translation as “writing by proxy”—with his own work interweaving these three motives simultaneously. I found his reading showcased an intricate layering of voices across time—the contemporary Irish poet uses modern English to ventriloquize the voice of medieval Scots poets—and the performance broke down any clear binary between an act of (derivative) translation and (originary) creation. In this venue, I was invited to listen and attend to poetry as craft, and this experience provided me—a historicist literary scholar—with a refreshingly medieval sense of translation as a process of invention (in the medieval sense of inventio or perpetual re-creation), an ever-provisional reworking of material that arises from intimate encounters between present and past(s). The MAMO conference featured a surprising amount of plenaries, including a morning and evening one on each day of the conference. A somewhat unexpected theme that emerged throughout some of the plenaries was ecology—or rather, a series of discussions each putting into conversation a few modes of ecological thought. Carolyn Dinshaw’s newest work on queer temporality and amateur/professional medievalism was much invoked (see JEFFREY’s draft review of her book, How Soon Is Now? for more on this work) and I’ve seen various iterations of Dinshaw’s talk on the Green Man before. But with each recursive discussion, I discover Dinshaw enfolds this material with new resonance. What I found most intriguing in this particular version of her talk was a clear postcolonial perspective. Toward the end of her talk, Dinshaw discussed Randolph Stow’s astoundingly complex novel The Girl Green as Elderflower (1980), which features an Australian who returns to the home of his ancestors in East Anglia; in the novel's complex network of intertwining and embedded narratives, the Green Man serves not only as figure, device, or “emblem” of the porous nature/culture divide but also an animating force that radically transforms and unsettles static conceptions of race, ethnic belonging, sexuality, and existence in time. I felt fortunate that the organizers had asked me to chair a session on “The Natural World and Medievalism,” as I was so curious to see how each of the presenters would engage with this topic. Elizabeth Robertson demonstrated how devotion for the daisy in Chaucer’s Legend of Good Women provided some means of inspiration for Wordsworth’s poetry, and she suggested some ways to approach nature writing and locodescriptive poetry via Timothy Morton's ambient poetics. Arwen Taylor (a medievalist name if I ever heard one!) gave a paper on birds in the works of Chaucer and Tolkien; in this paper, she attended to birds as creatures who can act concurrently as signs and as avian agents that (who?) resist figuration. Helen Price—most closely engaged with Morton and recent ecocritical work by EILEEN and JEFFREY—widened the discussion to the localized poetry of Geoffrey Hill’s Mercian Hymns (1971) [read selections HERE and HERE], featuring hoarders of disparate objects, as well as evocative site-specific poetry/art projects like The Stanza Stones Walk (2010) of Simon Armitage. By the end of this session, I had become most interested in how the so-called “natural” world—flowers, birds, stones, other assemblages—veer away, withdraw from, or are utterly indifferent to human modes of signification and (linguistic) representation. Bruce Holsinger’s plenary examined how a narrative episode from the 13th-century Landnámabok—Thorkel Farserk swims across the Hvalseyjarfjord while carrying a sheep—gets appropriated in the work of paleo-climatologists as well as global warming skeptics. Working under the assumption that this body of water must have been warmer than it is today (or else Thorkel Farserk would have died of cold), some (amateur) climatologists invoke this story as a piece of evidence for a pre-industrial Medieval Warm Period (or Medieval Climate Optimum), a time when the North Sea was warmer that it is now (and also a time when Vikings were able to settle different lands and achieve all sorts of nifty things as a result). Holsinger revealed some of the ways the medieval past can serve any number of (pseudo)scientific and political agendas—including the use of this story to cast trends in warming as “natural” (not manmade) phenomena. Returning the overall discussion to the “professional vs. amateur” distinction, Holsinger suggested not so much the playful side of amateur medievalism but its potential for abuse. This sort of brute re-appropriation of a highly imaginative medieval text as “evidence” against (human generated) global warming might strike literary scholars as rather unsophisticated selective reading (and mischaracterization!) of a complex text. Holsinger ended by suggesting how more fully engaged interdisciplinary endeavors might operate: his ongoing research on medieval parchment, for instance, can bring literature, paleography, and art history into contact with historical genetics and paleo-climatology. Parchment—created from the skins of animals—carries the organic, material, and cultural traces of another time. MAMO was a well-organized and stimulating conference. I am pleased to see how academic medievalism studies is gaining more prominence, and this burgeoning field continues to encourage new ways to examine the enduring presence of medieval culture in our contemporary lives. From politics and policy to popular culture, we find the past that is not safely partitioned in a realm beyond our own; it potentially plays an intimate part of our everyday existence and modern ways of life. Thank you so very much for this detailed account, Jonathan. The juxtapositions and intersections of translation and ecology are fascinating - multiple voices indeed. I hope that we don't have to wait until the 700th anniversary of St. Andrews for a re-gathering (translation and ecology having pretty different intentions for us by then!). Thank you so much, Jonathan, for such an astutely observed account of the various 'translations' discussed at the conference. In Canterbury, a pilgrims walk is planned for September by colleagues at the University of Kent to start along the Downs Way and end in Canterbury with storytelling and merriment (as you would expect! )...another example of medieval-inspired modernity. @MGG: Thanks! This walk sounds great -- is this any annual thing by any chance? Might there be any Web component (streaming, blog, etc. )?